Plot: The plot is very simple, a bunch of Satanists in an out of the way area has ultimate powers to melt anyone that gets in there way. Soon they mess with the wrong people and soon a son vows revenge against them as loved ones become victims of the Satanic powers. Head Satanist Corbis wants to get his hands on a book that displays the names of those who sold there soul to the Devil. As you would guess literally "all hell breaks loose". The ultimate showdown of "I'm Melting" , " I'm melting" becomes an eye opening reality. The Devils Rain is a cult classic. A wonderful B-grade, cheesy horror gem that stands out, and makes the classic horror movie sense bleed off screen for the wonderment of the viewer who loves Midnight, Late Night Drive-In, B-grade cinema. Classic cast. Classic makeup and effects. It's a film that stands out and is very memorable. I first saw it at the Drive-In during a Halloween movie marathon back in the late 80's and I became an instant fan. I was super excited when I heard that Severin Films was bringing this horror gem to a solid special edition Blu-ray. I felt like I was a child waking on Christmas morn. Boy has Severin done an amazing job at bringing this horror film to a modern audience, and allowing them to experience this film in a stunning new transfer. A wonderful crystal-clear imagery and dynamic sound quality. Huge fan of Severin Films. They always create flawless examples of top notch products that truly shocks and leaves you with a lot of satisfaction. They take great care in releasing Grade A transfers of older films, obscure, lost by time, or never given the light of day or respect styles movies. Starring a retro ensemble cast. One and only William Shatner, instead of battling aliens as, Captain Kirk, this time around its, Satanist. The amazing Ernest Borgnine who I have to mention stared in well over 200 performances in Movie and TV form. He was a master actor, both character, side kick, or star. He was a one of a kind. It's sad thinking he is no longer with us. He left many great examples of entertainment. Also starring the very underrated Tom Skerritt who will always be remembered as Dallas by me, form the original sci-fi horror masterpiece Alien. Also, a young John Travolta. Also, the one and only Eddie Albert who also stared in well over 200 performances. And starring in a small part is real life Satanist and creator of the The Satanic Bible in real life, Anton LaVey. He is credited as the film's technical advisor. Also starring the stunning and very beautiful Ida Lupino. A wonderful actress who stared in over 100 performances. Started acting in 1931 and did so until 1978. Starring in a vast array of Drive-In flare and brilliance. From B-grade classics like 1950's Woman in Hiding, 1952's Beware, My Lovely, 54's Private Help 36, 55's Women's Prison, and the ultimate Drive-In Classic 1976's Cheese-tastic The Food for the Gods. It was wonderful seeing her again in The Devils Rain as the character of Mrs. Preston. I must say keep an eye out for the one and only Keenan Wynn. A true actor, character actor, voice actor. Performed in 280 performances. A sidelined character, a sheriff of few words, a bartender or a character with a full name, whatever he was in, he shined. I love watching old films and TV and spotting him. From 64's Dr. Strangelove, to 64's Bikini Beach as the character Harvey Huntington Honeywagon. Loved him in 66's The Night of the Grizzly. He was in so many Drive-In classics. B-grade films of perfect cheesiness. Who can forget him in one of the Crap-tastic, cheesiest of all time, the B-movie Masterpiece (Hahaha) 1978's Laserblast. Also in Drive-In greats like 78's Coach, 78's Piranha, 79's The Dark, 79's The Clonus Horror, 79's Sunburn, 79's The Glove, you could go on and on. Just an awesome character actor. The critics hated this movie. The reviews bashed and tore apart this film. Over the years it has garnered a cult following, and certain horror fans enjoy the overall B-movie grade quality. I for one love the weird and trippy film in all it’s over the top Satanic glory. Great classic makeup, gore effects that make you remember it. Severin Films has fixed and created a classic B-grade horror film and given an excellent new outlet. Directed by Robert Fuest. Fuest was a great B-Grade horror and suspense director that brought us, such Drive-in classics like, And Soon the Darkness (1970), The Abominable Dr. Phibes (1971), Dr. Phibes Rises Again (1972), but to me it's The Devils Rain that truly stands out. Many fans of the classic TV series, The Avengers will know him from directing 8 original episodes, and directing 2 episodes of The New Avengers TV show. Sadly, it was The Devil's Rain that most likely stopped his chances from directing anything worthier. Critics really bashed and ripped apart The Devil's Rain. No flaw in this department. Absolutely stunning. I have seen this film on the big screen, on VHS, on DVD, on bootleg DVD and also on TV, this Blu-ray is stunning. It has never looked any better. A beautiful, brilliant job. A perfect transfer. Vibrant colors and crystal clear audio, creates a dynamic reality. Severin-Films did a job and then some. It's perfection. Priceless Extras. They really gave us perfection in this reality. Confessions of Tom – Interview with Actor Tom Skerritt. Running almost 11 minutes. The Devil’s Makeup – Interview with Special FX Artist Tom Burman. Running a little over 5 minutes. 1975 Archive Interview with Actor William Shatner. Running almost 4 minutes. First Stop Durango – Interview with Script Supervisor Ana Maria Quintana. Running almost 15 minutes. Consulting with the Devil – A Conversation with the High Priest & High Priestess of the Church of Satan. Running a little over 10 minutes. Hail Satan! – Interview with Anton LaVey Biographer Blanche Barton. Running a little over 8 minutes. Filmmaker / Horror Collector Daniel Roebuck on The Devil’s Rain. Running 10 minutes and 33 seconds. On Set Polaroid Gallery of Script Supervisor Ana Maria Quintana. Running close to 8 minutes. Poster/Still Gallery. Running close to 8 minutes. Also comes with a reversing slip insert. I really don't care what was said in the past and the bashing and destruction of any hope of this film. I am a lover of Drive-In, B-to-Z-grade films. 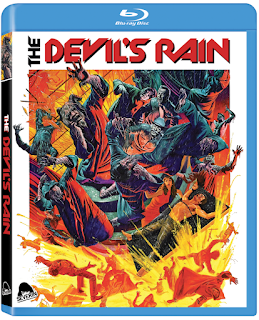 I love cheesy horror films and The Devil's Rain is a perfect Cult film with over the top perfection, that makes B-movies wonderful. Severin Films brought out a perfect Blu-ray.